Project Play produces valuable national resources analyzing the state of play in youth sports. Our work strives for solutions to promote healthy communities through sports so all kids are physically active, regardless of zip code or ability. The Playbook: Our seminal report, Sport for All, Play for Life: A Playbook to Get Every Kid in the Game, offers an aspirational model for youth sports in America with eight strategies for eight sectors that touch the lives of kids. It's the backbone of Project Play's work. Parent Checklists: The Project Play Parent Checklists, shown in interactive and video form, offer 10 questions parents should ask themselves, their child and potential sports providers to make sports a positive experience. The three sets of checklists vary by age and engagement level in sports. 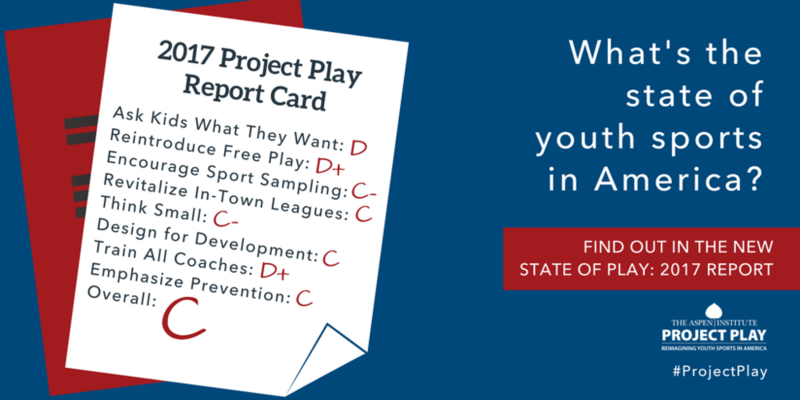 State of Play 2017: Our annual national state of play report offers a snapshot of how well stakeholders are serving children and communities through sports. We provide the latest sport participation data, 40+ key developments in the past year in each of our eight Project Play strategies, and what's next for the year ahead. Physical Literacy: Physical Literacy in the United States: A Model, Strategic Plan, and Call to Action offers a deep dive into the central idea behind Project Play. This report builds on research showing that children with motor skills competence are more likely to stay physically active into adolescence and adulthood, identifies the populations in greatest need, and offers 150+ activation ideas. All Reports: Since 2013, Project Play has produced many materials on youth and sports, including State of Play reports for regions and cities. Find all reports here, as well as our research archive. Benefits of Progress: One of the keys to inspiring leaders from the national to local level around making sport more accessible to kids is highlighting the benefits of progress. The Global Obesity Prevention Center at Johns Hopkins University projects that $20 billion of direct medical costs would be saved if just 50 percent of youth were active to a healthy level.